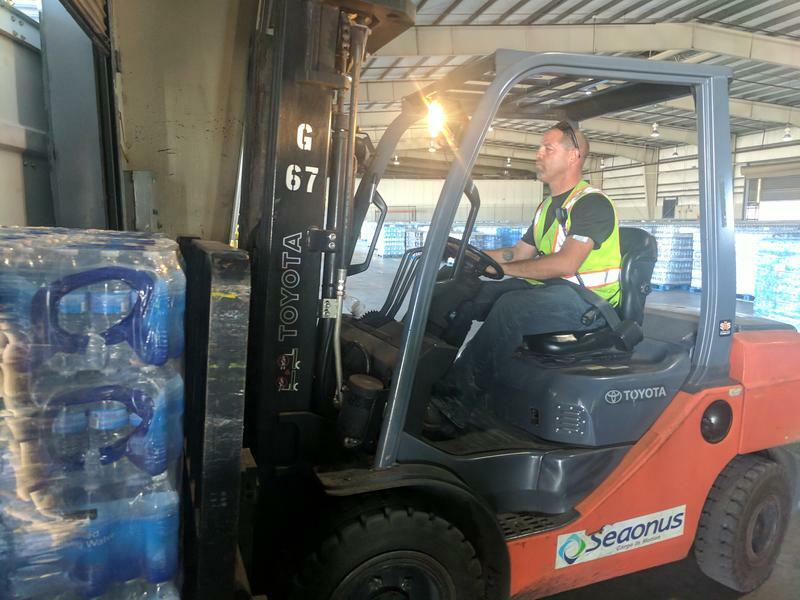 While the governor spoke to reporters, Crowley employees loaded 60 shipping containers with packed pallets of water for the U.S. commonwealth still languishing after being battered by two major hurricanes. “I think we’re over 3,000 now, as of this week. What you see here, this is roughly 60 containers. 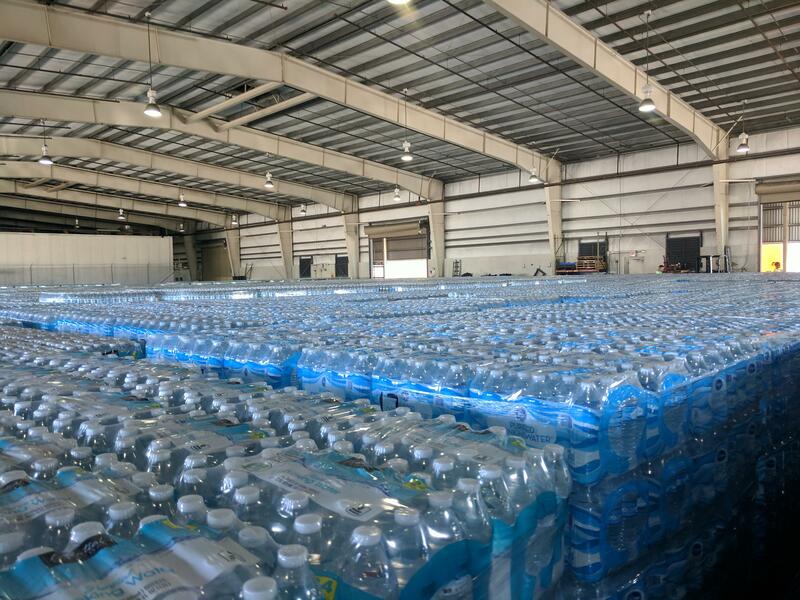 This is just over one day supply of water now, based on current demands,” Crowley’s director of disaster relief Bleu Hilburn said, gesturing to pallets of water bottles. Between 85 and 90 percent of all goods moving to and from Puerto Rico go through Jacksonville and one of the River City’s sister cities is the island’s capital, San Juan. Because Puerto Rico is a U.S. territory, its ports are under a 1928 law governing tariffs on imports and exports. The Jones Act mandates that a majority of a ship must be built in America and a majority of its sailors must also be U.S. citizens in order to do business in American ports. Otherwise, the law places heavy tariffs on foreign ships who don’t meet the act’s criteria. President Donald Trump was criticized for taking too long to waive the act. Lawmakers and some economists argued having the law in place, which was promptly waived following Hurricane Harvey in Texas and Hurricane Irma in Florida, hindered Puerto Rican relief efforts. But Gov. 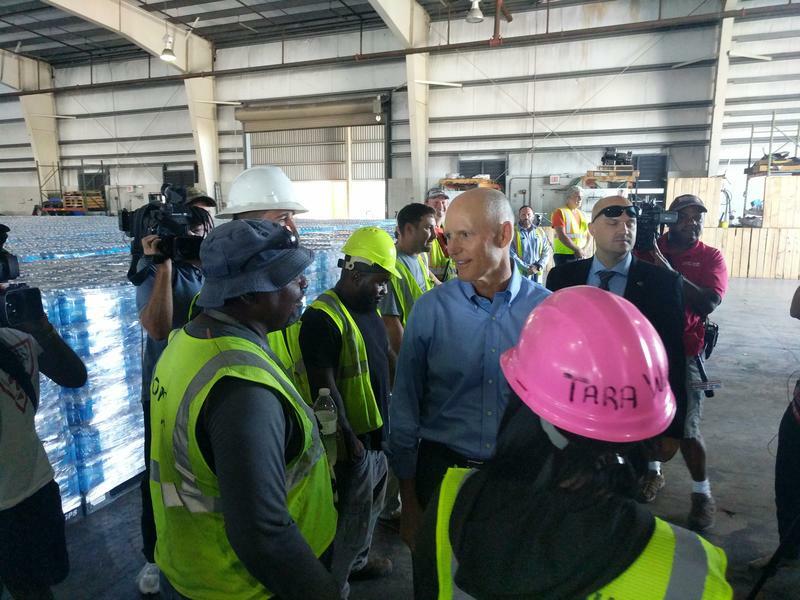 Scott said the act wasn’t a problem for the island’s disaster relief, as many goods made it to Puerto Rican ports. He said instead it was a logistical and manpower problem transporting supplies once they arrived. “It was not an issue of getting things in there; it was getting things out of their port. Where their shortage was is drivers and trucks. It wasn’t [that] the port was getting full of stuff and the warehouses were getting full — it was getting stuff out of there,” Scott said. Crowley ships are also in charge of moving trucks and other JEA equipment from the mainland to the island to aid in power restoration — around 95 percent of the island is still without power. 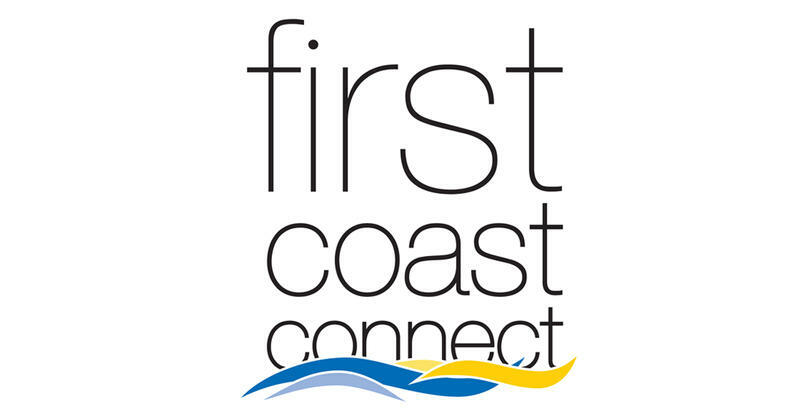 Forty-one JEA employees will follow the trucks on planes departing Jacksonville Thursday. Gov. 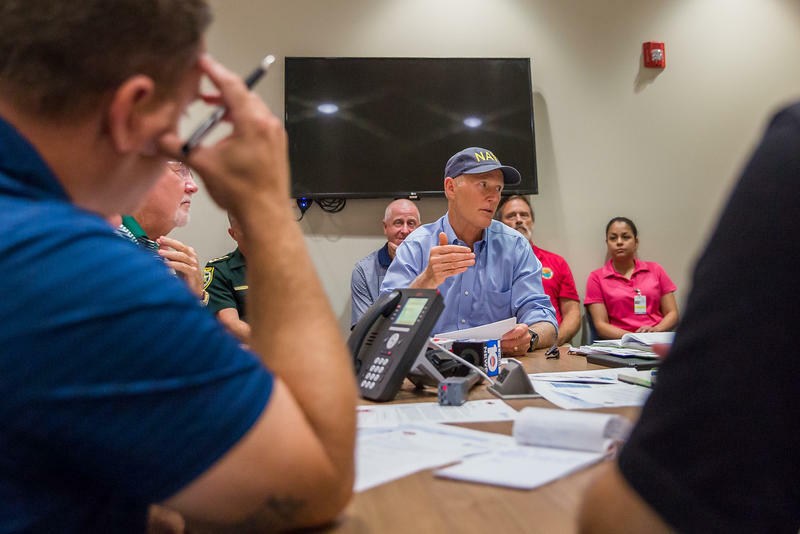 Scott told reporters he witnessed the devastation firsthand and declared a state of emergency in Florida as the state recovers from Hurricane Irma and expects a wave of Puerto Rican refugees, who are American citizens. “We’ve opened up three disaster relief centers. One at the Miami airport, one at the Orlando Airport and one at the Port of Miami to work with anybody that’s coming here from Puerto Rico,” Scott said. Florida is also sending a group of vehicles and law enforcement officers from the Highway Patrol and Florida Department of Law Enforcement to help Puerto Rico in law and order efforts. Scott said he is not in favor of any changes to the Jones Act. Ryan Benk can be reached at rbenk@wjct.org, at (904) 358 6319 or on Twitter at @RyanMichaelBenk. Gov. Rick Scott on Monday declared a state of emergency in Florida in anticipation of ripples from the growing humanitarian crisis in hurricane-ravaged Puerto Rico. 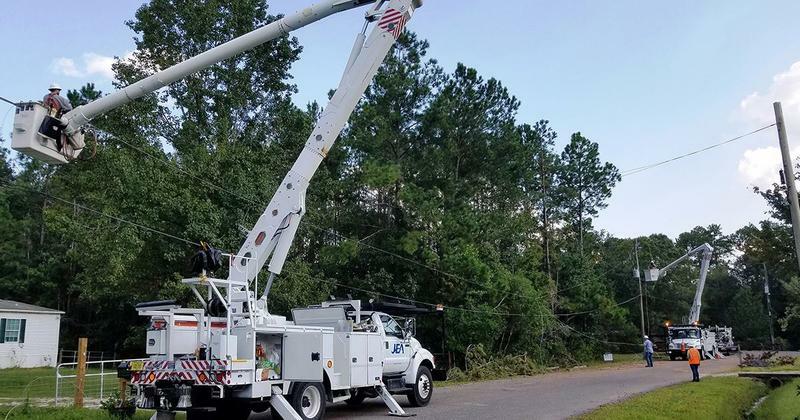 Jacksonville utility JEA is sending more than 40 workers to assist in power restoration efforts on the island of Puerto Rico.